How would you demo the new Mac Pro? Three or four times a year Apple has press events that are designed to get media coverage all over the world. Although they cost up to a few hundred thousand dollars to organise, they get millions of dollars of PR all over the world. For those of holding our breath waiting for MacBook Pro, Mac Pro and Final Cut Pro X announcements, perhaps we can reverse engineer what Apple might announce tomorrow based on what kind of coverage they want. News articles, TV and radio reports have a limited amount of space to cover everything that Apple announce. The headline will refer to an update of the product or service known by the largest audience. The first paragraph will expand on the headline, explain the context (“Tim Cook on stage in San Francisco…”) and then go on to expand on other announcements. Although the contribution of Mac Pros and professional software to Apple’s bottom line will struggle to reach single percentage digits, Apple would not have developed the new Mac Pro unless it fitted into an ongoing strategy. It’s a chance for Apple to make the fastest, most powerful computer it can, besting its own past efforts and the efforts of its competitors, year after year. This is Apple’s space program, its moonshot. It’s a venue for new technologies to be explored. What could Apple announce tomorrow that gives a hook for the world’s media to use when mentioning a new Mac? A keynote slide with listing features and specifications won’t work. The public aren’t interested in Thunderbolt 2, fast GPUs or a new Haswell CPU from Intel. There’s a good chance that there’ll be a demo. What demo would be simple enough for the press to understand and interesting enough to mention in articles and news reports? One strategy for being reporter- and reporting-friendly is to incorporate a famous person or a famous task. Here are three I’ve come up with – each would imply a different software story to go along with the Mac Pro hardware. How would you demo a new Mac Pro to the world’s media? HDMI 2.0: Another piece of the 2013 Mac Pro Puzzle? Today the HDMI Forum announced a big upgrade to their video connectivity standard: HDMI 2.0. What does this mean for this autumn’s ‘4K’ Mac Pro? HDMI (High Definition Media Interface) is a successful video and audio interface standard that has been used in over 3 billion devices since 2003. It is used to transfer uncompressed video and audio from one device to another. The initial definition defined a maximum video resolution over a single connection of 1920×1200 at 60 frames a second with 24 bits used to represent each pixel, using a maximum throughput of 4.95 Gbit/s. The cables and connectors haven’t changed, the definition of the data that can be transmitted along the wires has changed. Apple is a member of The HDMI Forum, so what does 2.0 mean for Apple products? In June Apple previewed this year’s new Mac Pro. Many were surprised that Apple included six Thunderbolt 2 ports and an HDMI 1.4 connection. Firstly, Thunderbolt 2 had only been announced a few days before by Intel with the first products using the new standard expected in 2014. Secondly, given that Apple said that the Mac Pro is designed to be a full 4K editing device, why include an HDMI port that can only handle 24 frames a second at 4K? HDMI 2.0 could explain some of the Mac Pro specification. Thunderbolt 2 is implemented using Intel’s Falcon Ridge I/O controller. It doubles the possible maximum throughput of the connection in one direction from 10 Gbit/s to 20 Gbit/s. It also allows Apple to launch a range of 4K monitors that use HDMI 2.0 data standards. Knowing Apple however, they may transmit the HDMI video and audio signals along a special Apple-flavoured Thunderbolt 2 cable instead of using standard HDMI connectors and cables. HDMI 2.0 might mean there’s more to the Mac Pro’s 4K ambitions than Thunderbolt 2 and a new version of Final Cut Pro X. Coming soon: Apple’s desktop Retina display – which would you choose? When Steve Jobs launched the iPhone 4 in March 2010, one of the big new features was a much higher resolution screen. The iPhone 3GS 3.5″ screen displayed 320 by 480 pixels. The new phone displayed 640 by 960 pixels in the same space. The number of pixels displayed per inch increased from 163ppi to 326ppi. Developers didn’t have to change the layouts of their applications to run on the new phone. Instead of displaying 320 by 480 apps at half the size on the 640 by 960 screen, the new version of iOS used twice the pixels horizontally and vertically to show the same content. Since then developers have designed their iPhone apps to work on 320 point wide screens even though the vast majority of users will see them on 640 pixel wide screens. Apple marketed this new screen as a ‘Retina display’. Apple later said that the definition of a Retina display is a screen where individual pixels cannot be distinguished at a normal viewing distance. In the case of the new phone, it would have to have a screen resolution of at least 300ppi when used at a distance of 10-12 inches. The combination of figures is summarised as ‘Pixels per Degree’ – the number of pixels per degree as seen from a specific distance. 300ppi at 10″ equates at a PPD of 53. The iPhone resolution of 326ppi at 10″ has a PPD of 57. Minutes after the launch, Apple fans started speculating when other products would get a Retina display update. The top of the range iPod Touch followed in September 2010. The iPad got a Retina display in March 2012, followed soon after by Retina MacBook Pros in June 2012. With every new launch event, may hope for a Retina display as part of the specifications for new Apple products. But what does Retina mean for iMacs and desktop displays? 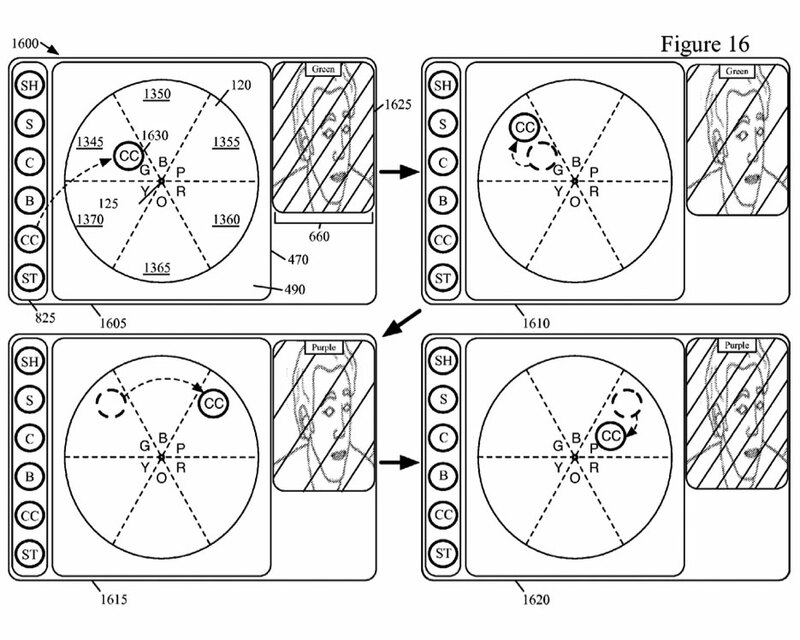 In August 2010 (almost a year before the introduction of Final Cut Pro X) Apple applied for a user interface patent that is relevant to colour correcting video clips. They were awarded patent 8,468,465 today. Although Apple has chosen a different UI for colour correction in Final Cut Pro, the UI shown in this new patent may turn up in future Apple applications. Some embodiments provide a computer program that provides a graphical user interface (GUI) for controlling an application. The GUI includes a contiguous two-dimensional sliding region for defining several values. The GUI also includes several sliders for moving within the sliding region. Each slider selects one or more values from the several values based on a position of the slider within the sliding region. The selected values are parameters for controlling one or more operations of the application. I’ve come up with a product idea that might satisfy many people with this complaint: A PCI Express card that can be installed in an older Mac Pro that uses one or two Thunderbolt 2 cables to connect to a 2013 Mac Pro. This would turn the old Mac Pro into an expansion chassis for the new Mac Pro. This solution would provide access to the other PCI Express cards in the old Mac plus internal storage and disc burners (by connecting internal cables to the card if access via the PCI bus is a problem). Such a card is easier to engineer than a whole expansion chassis. The old Mac Pro provides everything needed but the interface. A valid idea for Kickstarter? 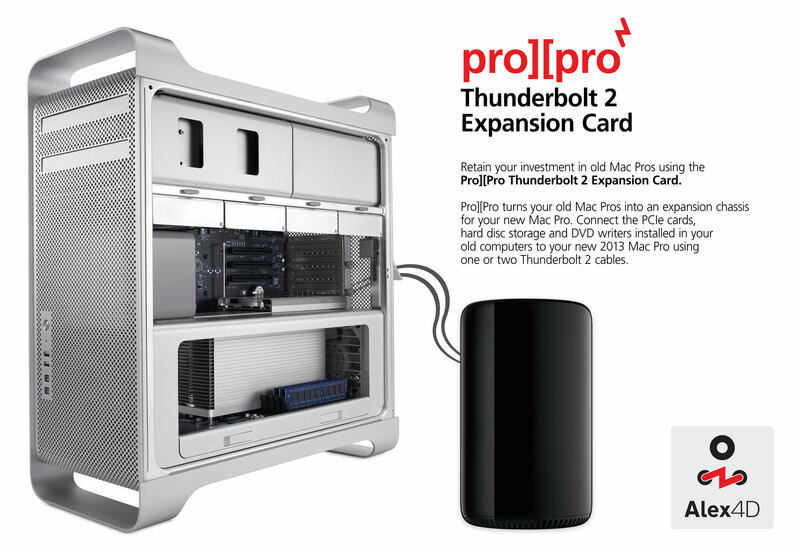 The pro][pro card for your new Mac Pro… and your old Mac Pro too. Here’s how a powerful AMD graphics card compares with what Apple has announced about the AMD FirePro GPUs in the forthcoming Mac Pro.